You can help make a difference for Democrats in elections across the United States by picking up the phone and calling others like you. Voting makes a difference as we have seen in many tight elections and votes from Abroad count! 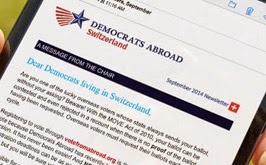 This spring we will make sure that all several thousand members of DA Switzerland know they need to request their absentee ballot for November 2012 elections. Click on "Read more" below to RSVP. You will be provided with a detailed script and talking points to help you with your conversation. Come by for training. Bring your mobile phone or laptop with skype to make calls. Take a call sheet home to work on over the next week.